In this photo taken, July 25, 2016, some of the more than 30,000 Nuer civilians sheltering in a United Nations base in South Sudan's capital Juba for fear of targeted killings by government forces walk by an armored vehicle and a watchtower manned by Chinese peacekeepers. When heavy fighting broke out between rival forces in South Sudan’s capital last month, Simon Bingo felt he had no choice but to flee his birth country for the second time. But with widespread reports of residents getting looted, raped and killed in the streets of Juba, Bingo knew he had to wait for an opportunity to leave safely with his wife and baby. Tens of thousands of people have fled South Sudan since a fresh cycle of violence erupted in and around Juba on July 7. More than 60,000 refugees have flooded into bordering Uganda alone, while thousands of others have trickled into neighboring Kenya and Sudan, the United Nations said Wednesday. The world's youngest nation is teetering on the brink of disaster. Not long after gaining independence and emerging from civil war, South Sudan was plunged back into conflict in December 2013 when President Salva Kiir sacked his then-deputy Riek Machar and accused him of plotting a coup. The personal rivalry sparked fighting between forces loyal to the president and rebels allied with Machar. It also deepened a rift between two of South Sudan’s largest ethnic groups -- Kiir’s dominant Dinka and Machar’s Nuer people. Facing sanctions and mounting pressure from the international community, the sparring sides signed a power-sharing agreement in August 2015 with the promise to end nearly two years of ruinous war. The peace deal gives Kiir’s ruling party the positions of president and vice president, a majority in the legislature and 53 percent of ministerial portfolios in the transitional government. In turn, Machar gets the newly formed position of first vice president, alongside the current vice president, until the transitional period ends. His rebel faction would have the second-largest number of seats in the legislature and 33 percent of ministerial posts. And in the oil-rich Upper Nile state, the rebels would select the powerful post of governor along with 40 percent of minister positions in the war-ravaged region. The agreement also requires elections to be held 60 days before the end of the transitional government's mandate and the completion of a permanent constitution no later than 18 months following the start of the transitional period. But Machar fled again to an undisclosed location last month when fighting broke out between his forces and Kiir’s. The president gave his first vice president 48 hours to return to Juba before replacing him with Gen. Taban Deng. South Sudanese government spokesman Michael Makuei Lueth has denied the reports of new fighting between Kiir’s supporters and Machar’s. In a statement issued on Aug. 2, Lueth said that the troubled peace deal signed last year remained intact. “The media has been abuzz with news of fighting throughout the country, however, we want to assure the region and the whole world that the cease fire, which was recently ordered by the president, is firmly holding, and that all those reports are false and baseless,” the statement read in part. Newly arrived refugees from South Sudan queue to receive food at the Nyumanzi transit center in Adjumani, Uganda, on July 13, 2016. According to U.N. figures, the latest upsurge in violence has brought the mass exodus of South Sudanese refugees to neighboring countries since December 2013 to almost 900,000. U.N. officials said local militias have been taking advantage of the turmoil in South Sudan, where more than 2.6 million of its citizens are forcibly displaced. 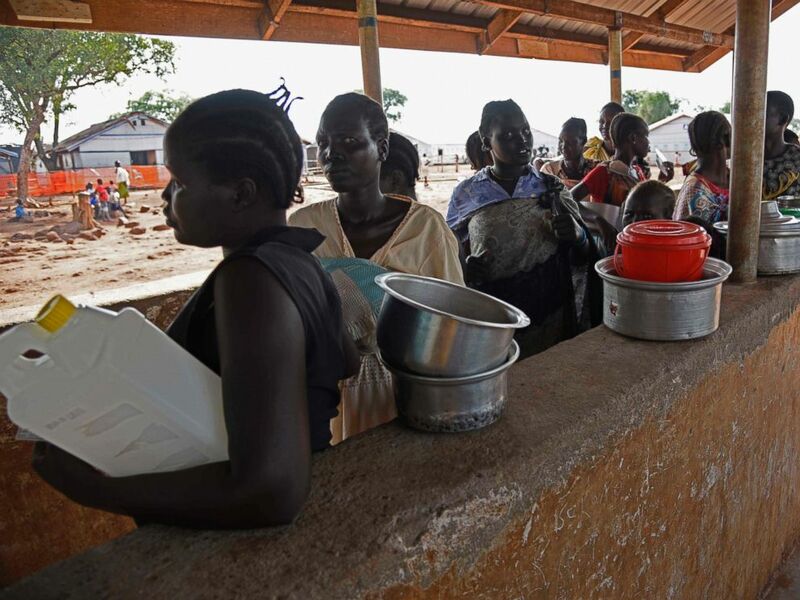 The conflict has dramatically worsened food insecurity in South Sudan. Fighting has crippled food production in the region, and the high inflation rate has made the steep cost of food staples and basic commodities unaffordable to many civilians, like 29-year-old Bingo. Bingo, a video editor and producer for South Sudan’s state TV station, said the price for a bottle of water surged from 1 to about 7 South Sudanese pounds, and the cost for local fare at a restaurant jumped from 20 to 80 South Sudanese pounds, he said. 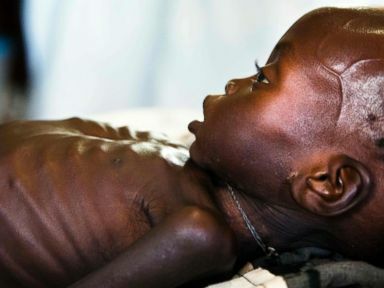 U.N. officials said that 4.8 million residents are in urgent need of food, nutrition and livelihoods assistance, with a quarter of a million children facing severe acute malnutrition. U.N. emergency relief coordinator and under-secretary-general for humanitarian affairs Stephen O’Brien visited South Sudan for three days this week, where he met with locals, senior government officials and humanitarian partners. He said he saw firsthand how the crisis is unfolding in Juba as well as the northwest cities of Wau and Aweil. 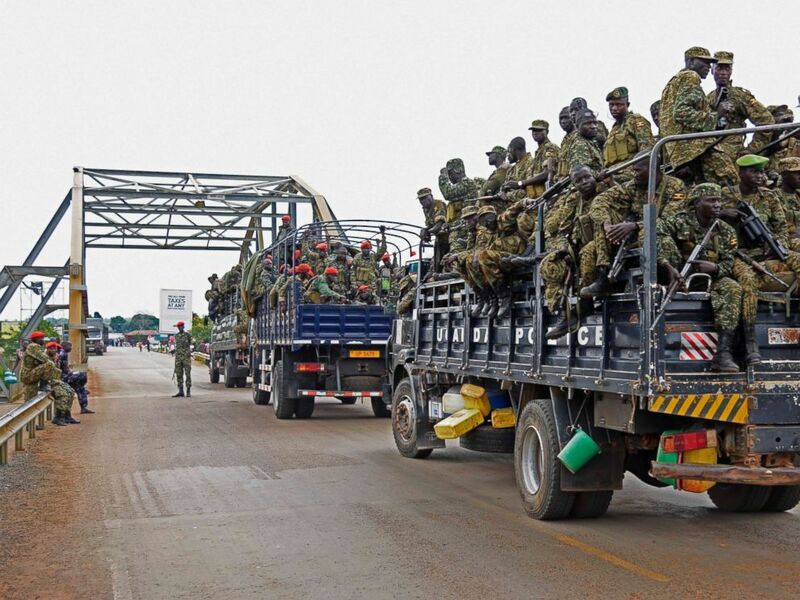 Uganda military personnel are seen atop military and police trucks as they drive towards Juba in South Sudan at Nimule border point, on July 14, 2016. Bingo organized South Sudan's first-ever film festival, which ran from July 4 to 7. The event had wrapped up in Juba when the new clashes started. "The whole festival was good," Bingo told ABC News. "People were moving at night seeing the films, and then all of a sudden fighting breaks out. A lot were killed." A few days later, he saw the Ugandan military evacuating its citizens from Juba and realized that was his chance to leave the country safely. One morning before sunrise, Bingo, his wife, their 1-year-old daughter and three other relatives frantically loaded into their car with just a spare set of clothing, travel documents and some cash borrowed from friends. They drove some 125 miles south from Juba to Nimule alongside the heavily armed Ugandan convoy. Bingo said he pleaded with authorities at the border town who questioned his family before allowing them to cross. “I said, ‘I am taking my child to safety. It is not about me; it is about the family,’” he said. After crossing into northern Uganda, Bingo and his family slept in their car overnight in Gulu and arrived in the capital, Kampala, a day later. The six of them are staying in a cramped one-bedroom apartment. They are running out of money, and Bingo hasn’t been able to find work. “We are eating once a day -- only dinner,” he said. It’s the second time Bingo has fled his birth country. He lived in refugee camps with harsh conditions in northern Uganda and Kenya as a child for a decade amid the Second Sudanese Civil War, which lasted for 22 years and is Africa’s longest-running conflict. He returned to South Sudan in 2009, just four years before his home country entered yet another civil war. Bingo said he plans to return to Juba alone so he can continue working and send money to his family in Kampala.